At least 30 Republican lawmakers have been viciously attacked or threatened with death over the past several months. The threats culminated last week with the attempted assassination of several Republicans playing baseball on a Virginia field. 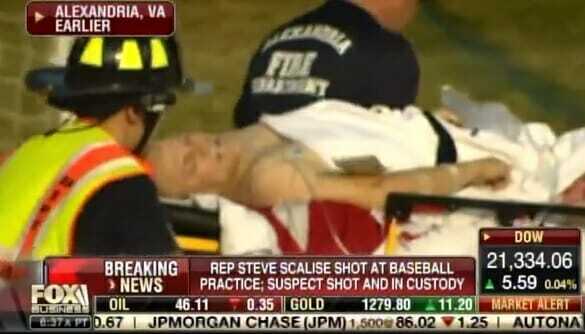 Rep. Steve Scalise (R-LA) is still recovering after a bullet ripped through his gut. The attacker was a staunch Bernie Sanders supporter. Rep. Jason Chaffetz (R-UT) played audio of two of his many death threats on FOX and Friends this week. The Utah Republican says he has received dozens of these threats. Chaffetz says the US attorneys will not prosecute these offenders. Chaffetz: Unfortunately these things happen regularly but the US attorneys will not prosecute these things… I’ve got stacks and mounds of written threats that people put their names to, some as emails, but again they don’t get prosecuted. There’s got to be a way to better protect members of Congress.